Cold snowy night or just cold and windy?! You want something to warm you back up, this may be the recipe to try. It is simple and can be adapted easily to whatever beans and veggies you like, or whatever your fridge and pantry have to offer. 1. Add olive oil to medium-sized saucepan and heat. Once the oil is hot, add the onions, carrots, bell pepper, and chile pepper. Cook the vegetables for 3 to 5 minutes, stirring occasionally. 2. Stir in remaining ingredients (except shredded cheese and sour cream). Heat to boiling. Reduce heat to medium-low; simmer uncovered for 10 to 15 minutes (or until vegetables are tender), stirring occassionally. 3. 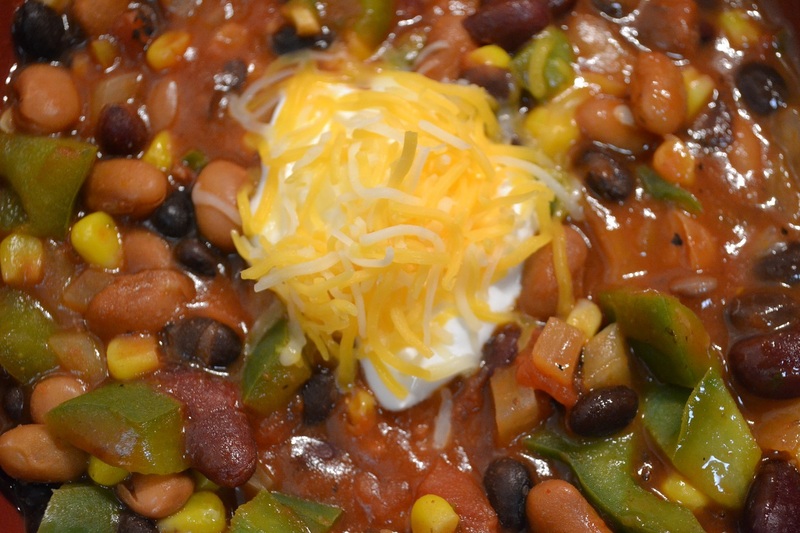 Serve chili with a dollop of sour cream and sprinkled with shredded cheese. Categories: In The Kitchen, Main dishes | Tags: chili, hearty, vegan, vegetarian | Permalink. It’s a cold night and you are camping. You want something to warm you back up, this may be just the recipe to try. It is simple, delicious, and healthy… and it can be adapted easily to whatever beans and veggies you like. 2. Once heated through (approximately 30 minutes), add spices. Stir and enjoy sprinkled with cheese and fresh baked bread. * Ingredients mentioned above would more easily fit a 10-inch Dutch oven, but if you temporarily place some of the chili into one of the empty cans, while the rest is heating, an 8-inch dutch oven will work as well. * Combine spices before camping trip and store in little plastic container or ziploc bag. Reducing recipe by half will be sufficient for two people and will more easily fit into 8-inch Dutch oven. * Assuming, you are making this when camping: Cut all the veggies before cutting the jalapeno pepper. Also, it will be best if you have a ziploc baggy that you could use as a glove substitute when cutting the jalapeno pepper. This will make it easier to avoid getting a lot of the jalapeno juices on your hand and prevent needing a lot of water to wash it off later. * Carrots are a great source of beta carotene, vitamin C and B, fiber, calcium, iron, and potassium. * Kidney beans are rich in potassium and magnesium, thus they help to keep blood pressure in check. In addition, the high fiber content can help to reduce bad LDL cholesterol.. Kidney beans are also rich in iron and protein, making them a great meat substitute for vegetarians. * Tomatoes are rich in vitamin C and E, beta carotene, magnesium, potassium, and calcium. 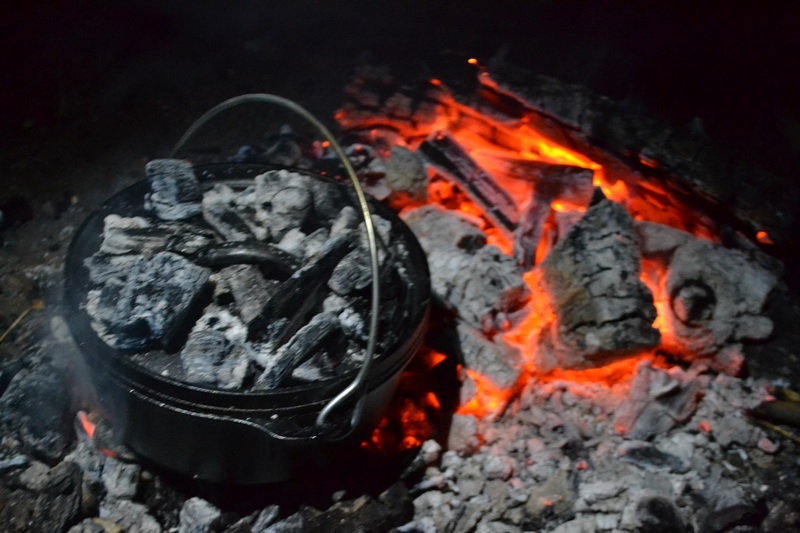 Categories: Dutch Oven, Dutch Oven Dinners | Tags: camping, carrots, chili, dutch oven, kidney beans, tomatoes, vegan, vegetarian, year-round | Permalink.